Lead has solidified his place as one of the most versatile, household names in bad acting. He has touched and poisoned the lives of millions from Ancient Rome to today’s urban dwellings – Silverlake, watch out! Even though his performances have been recognized as toxic for hundreds of years, his complex ability to cause damage has only recently been understood. So subtle were his performances, that before anyone knew it, Lead had penetrated everything from paint, piping, children’s toys, baby bibs, jewelry, handbags, lunchboxes, artificial turf, wheel weights, lipstick, candy, and a range of industrial applications. Lead has a profound ability to damage children’s intellectual and behavioral development, and even though banned in paint during the 70s, leaded paint is still the leading cause of childhood lead poisoning. Serious, parental discretion is advised. No safe threshold for Lead has ever been discovered, and his performances continue to be linked with learning disabilities, infertility, cancer, and increased risk of heart attacks. Lead is a proud, charter member of California’s Proposition 65 List. An element with symbol Pb, atomic number 82, solid form. 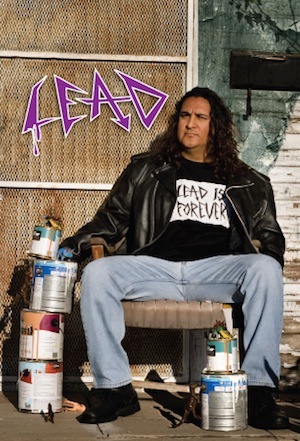 You’ll recognize Lead, the Original Bad Boy Gangster from many of his more original industrial applications like lead-acid batteries, weights, and as part of solder. This bad boy has wielded his star power far beyond industrial applications and extened his turf to include things in your home like lead-based paint, piping, toys, baby bibs, jewelry, handbags, lunchboxes, artificial lawns, Bounce Houses, lipstick and candy! Lead has a profound ability to damage children’s intellectual and behavioral development, and can cause blood and brain disorders. We know that even small levels of Lead’s evil contact can have huge effects on human health. Lead poisoning typically results from ingestion of food or water contaminated with Lead, but may also occur after accidental ingestion of contaminated soil or dust. Lead interferes with a variety of body processes and is toxic to many organs and tissues including the heart, bones, intestines, kidneys, and reproductive and nervous systems. In adults, Lead has received rave reviews from some of the most famous and mainstream health agencies for his antagonistic ability to help cause cancer, infertility, heart attack and kidney failure. He’s hated by all- old, young, male and female! linked with lower scores on IQ tests, lower scores on standardized reading and math achievement tests, decreased attention and memory problems. Recent research looked at children and teens ages 4 to 15 who participated in a national monitoring program at the Center for Disease Control and Prevention. The study showed that lead exposure may be responsible for Attention Deficit Hyperactivity Disorder (ADHD) in almost 300,000 children. Lead also reduces our ability to have healthy children. Two recent studies, one from the Taiwan Institute of Occupational Safety and Health and the other from Brown Medical School, showed that women with higher lead exposures were more likely to have infertility problems. States have tried to bring Lead down by limiting his star performances. In California, for example, there are laws limiting the lead content of electronics, plumbing parts, packaging, jewelry, candy, and wheel-balancing weights. The Consumer Products Safety Improvement Act (CPSIA) of 2008 mandates that there shall be no more than 300 parts per million (ppm) of Lead in children’s products. Under Proposition 65, Safe Drinking Water and Toxic Enforcement Act of 1986, Lead exposure is highly regulated in California. Recently, Lead has been represented by some of the hardest hitters (some of them unexpected) in the industry like The Toy Industry Association and The Alliance for Children’s Product Safety.